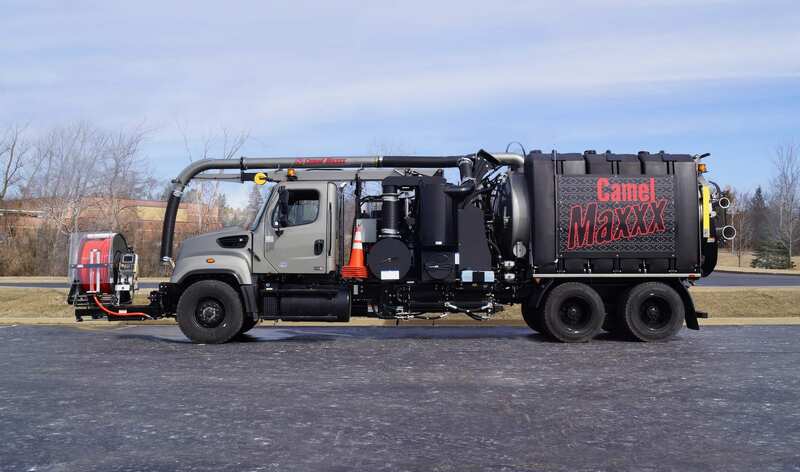 Super Products introduces Camel® Maxx 1200, the latest in its line of sewer and catch basin cleaners that offers maximum performance, maximum reliability and maximum profitability. Offering 1500 gallon water and 12 yard debris capacity, the Camel Maxxx 1200 features a large 7-inch display at the front control panel. A number of functions including vacuum and engine speed; water flow and pressure; emergency stop switch; LED panel lights; and panel controls can be operated. The Camel Maxxx utilizes a heavy-duty transfer case with a hot shift blower control at front operator’s station, eliminating trips back inside the cab to turn the vacuum pump on and off. An extreme transfer case and hydraulic cooling system allows working continuously without the fear of overheating. The boom on the Camel Maxxx is capable of 217 degree hydraulic worm gear rotation and vertical lift up to 21 feet with reach up to 26 feet. The boom can lift 1000 pounds. The boom on the Camel Maxxx is also capable of 4 foot downward pivot to enable deeper reach. The downward pivot also makes for quicker, easier hose change outs. Camel Maxxx comes with new wired and wireless remote control pendants, capable of operating 22 functions, with built-in backlit LCD information screen. Available on Camel Maxxx is Super Products’ legendary wastewater recycling system. With this system, fill it once and work all day.